Stopped overnight. Easy acess pull throughs. Friendly staff. Near I26 but quiet. Nice dog park. Would stop here again. Perfect overnight stop returning to the Coast. Owners were very helpful. Bathrooms were modern, clean, spacious, and bright. Easy access to I 26. Will stop here again! Absolutely lovely RV park. We thoroughly enjoyed our stay. Even though it rained quite a bit while there, we felt comfortable and the area dried quickly overnight. It was easy to maneuver around in our 40' MH with tow. Getting in was somewhat uneasy as the turn off the road is rough, but not too bad. Owners were very nice and made us feel welcome. We were escorted to our site which was a great help. We will definitely stay again if we come this way again. We didn't use the restrooms so no review. This is the kind of place you hear about but never see. It's beautiful & so peaceful here. The rates are great. The family that runs Magnolia RV Park & Campground are super friendly. They have a little store that has awesome prices unlike a lot of other places. There is a Laundry room with air conditioner. There pool is salt water, which is better for your skin. They have movies on Saturday nights, we watched one last night & laughed so hard. We will definitely be back many more times. We love it here. If you go to church I recommend Fairview Baptist Church it's om the same Road as the campground about 1-2 miles up the road. My husband & I attended this morning &we loved it. The people were so friendly we will be back there again when we come here. It started when l called ahead to find out what to do for late check in. I told them we would probably be 830ish and we neede d to stop at Walmart for supplies. Told us not to go to the one closest on the map but go to Spartanburg because it was easier on and off with an RV and it was. The office closed at 8, when we arrived at 845 the owners were sitting on the porch waiting for us, hopped in the golf cart and showed us to the spot, and pointed out where our electric and water were(it was getting kinda dark) said have a good night and rode off. THE BATHROOMS ARE AMAZING! Cleanest I have ever seen. The pool had to close for about an hour at 645p one night due to storms and several groups wanted to swim. Instead of slapping the closed sign back up in 15mins at 8p when the rules said it closed, the owners hung out until about 9p and let everyone enjoy their beautiful pool for a bit. It was an excellent campground and I would recommend it to anyone! We only stayed on night as we were passing through, but were well pleased with the campground. 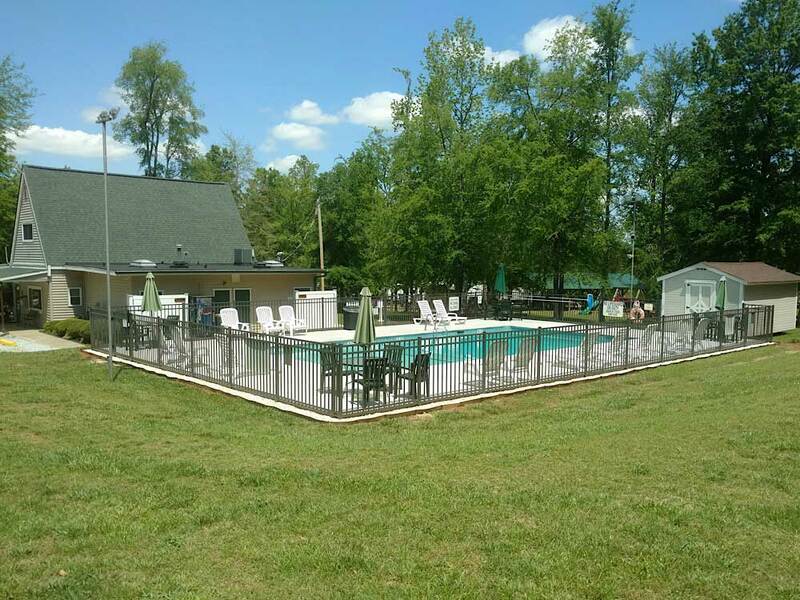 The owners were very nice, the campsites shaded and the grandkids loved the pool. The bathrooms and showers were very nice and well maintained. Will definitely stay there again when in the area. What a great staff!! They were most helpful & informative about the park & area. The park itself is kept up, there is ample space between sites to enjoy your time. We stayed at this facility for 3 days. The owners are on site. Very friendly and helpful. The sites sites are gravel, but level. They have a very nice shower house. One of the best we have seen. It appears that they were redone fairly recently. There are lots of trees which made using our satellite out of the question. They don't have cable, but we could get the major stations out of Charlotte. The roads can be dusty. However overall, we would stay here again. I can really recommend a stay while traveling at this rv park. The new owners are gracious and helpful. The facilities are especially clean. We were caught there during the Oct. rains in S. C. The owners made our stay as pleasant as could be. Please note that improvements are in the works.